This just in! 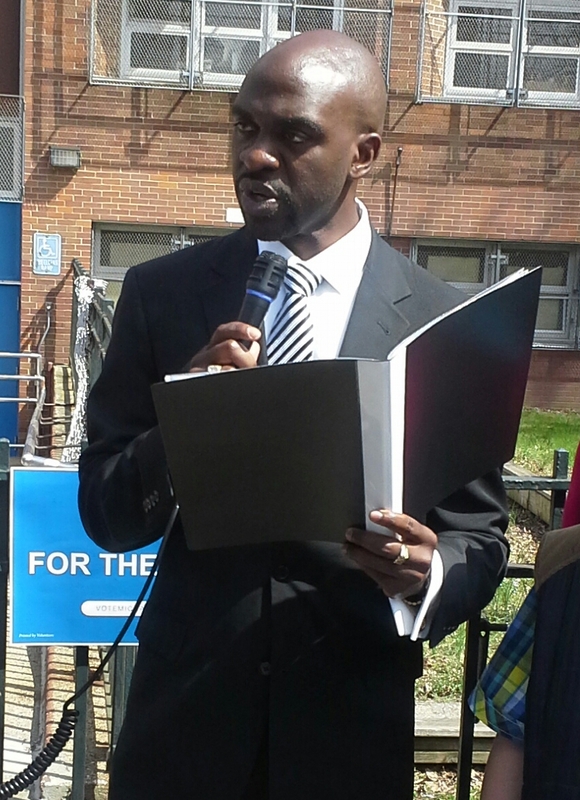 Bronx Democratic insurgent and Obama acolyte Michael Blake raised an additional $38K bringing his fundraising total to nearly 200,000. Team Blake has spent an equally astounding $155,000 three weeks out from Primary Day. The Blake campaign has $43,806 cash-on-hand. Presently, Blake’s candidacy is in the hands of a Bronx Supreme Court justice who must decide if Blake meets the state constitution residency requirement of five years in the State of New York. Click here and here to learn more about the residency challenge. A ruling on the residency issue is expected this Wednesday, August 13. Michael Blake, who raised $159,000 in July, reported raising another $38,574 in his 32 Day Pre Primary Disclosure. Total raised: $198,195; total expended: $155,000. Blake received only 11 donations from Bronx zip codes as opposed to raising $30,890 from 97 out-of-town donors. He accepted $4,100 from Ditri Managment, a firm in Palm Beach Gardens, Florida. Recognizable donors include anti-violence activists Tamika Mallory (formerly of the National Action Network) and Erica Ford as well as Michelle De Pass, Dean at the Milan School of International Affairs (New School), former Superintendent of Bronx High Schools Norman Wechsler, and Minyon Moore, a former senior advisor to Hillary Clinton. In comparison to Blake, Marsha Michael, the choice of the Bronx County Democratic organization, is the underdog. Her campaign appears woefully underfunded and is being outspent 20-1. Whoa! Ms. Michael, a court attorney, has raised a comparatively paltry $22,970 since her initial July 15th financial filing. Of her total, $21,450 came from unions, PACs and transfers from other elected officials war chests. She has raised $55,879 to-date. Unlike the free-spending Blake, Michael’s expenses were a stingy $7765. If Blake makes the ballot, Ms. Michael will need every penny of her reported $38,114 cash-on-hand (as of 08/04/2014). Ms. Michael appears to be relying on door-knocking and appearances at community events. She has done no direct mail to-date. Of the three other insurgent candidates who are on the September 9 ballot, only George Alvarez has shown an ability to raise money and to get his message out. As of July 15, Alvarez reported $43,000 cash on hand. Novice candidates Raul Rodriguez and Lanita Jones have raised very little money, have no real campaign infrastructure (Rodriguez has a website) and appear to running vanity campaigns. Fred Ricks, an actor/entertainer raised in Forest Houses, reportedly contrary to earlier reports has NOT dropped out of the 79th AD contest. This blog will continue to report on the happenings in the 79 AD as things develop. Image | This entry was posted in Elections, Finance, Government, Politics and tagged 79AD, bronx, fred ricks, george alvarez, lanita jones, marsha michael, michael blake, new york state assembly, President Obama, raul Rodriguez. Bookmark the permalink.